I enjoy making healthy soup recipes. Sometimes it's to warm up on a cold winter day. Other times it's because I can't resist stopping at a roadside stand to buy fresh produce that is so perfect for a summer soup. Saute onion in olive oil in pan until soft and clear. Add tomatoes chopped in pieces, basil, chicken broth, salt and pepper. Bring to a boil, then lower heat until soup is reduced by 1/4. Puree this mixture. Heat soup, add balsamic vinegar, and stir in cream. Garnish with basil or cheese. 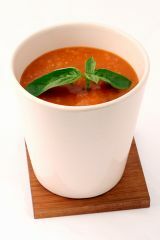 This healthy soup recipe is also good for drinking cold when you are on the go! Brown beef in a large kettle and drain. Stir in dry soup mix and heat. Add remaining ingredients (excepting rice) and bring to a boil. Reduce heat and simmer until peppers are soft (about 30 minutes). Add rice and heat. Are you here because you are searching for an answer to that nagging "What can I make for dinner tonight?" If you dread meal planning and are often out of ingredients that you need NOW, you can be organized for 100 days! The Menu In a Box includes family-friendly recipes along with shopping lists and meal plans. Plus, it has time saving, budget, and organizational tips.